You know what they say, that if life gives you lemon make lemonade. I add to this by saying that if you get snow in March, enjoy it by doing snow painting! Here's a super fun activity that the kids and I enjoyed over this weekend with all the snow in our backyard. Add food color to the water and fill in the bottles. We kept some water in a bowl also to use with a detail brush and added some color in the bowl. I believe art is messy so let your children create, be messy and enjoy their creativity.Each of the bottles gives a different effect. The spray bottle give a splash of color and we used the ketchup bottle to make dots. The detail brush can be used for lines. Make sure the colour is thicker for the detail brush. You can add twigs, stones and leaves to provide more options for art discovery. My kids loved the snow painting activity because they were free to create as they wish and it helped spark creativity. The kids can mix colors and learn how secondary colors are formed. 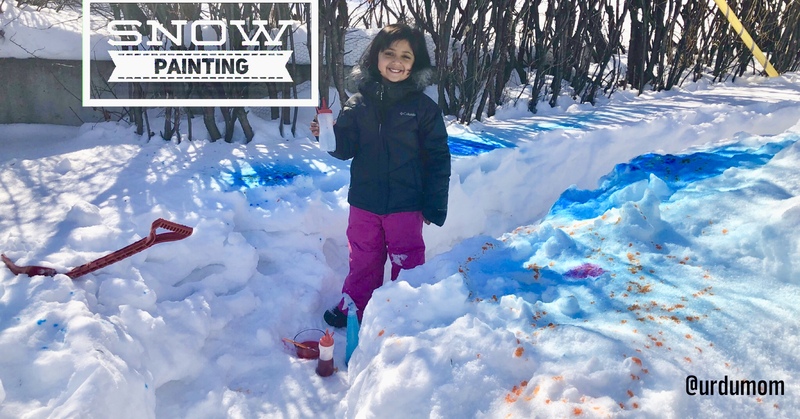 Snow painting encourages free play and for kids to discover art in an engaging way. Hope you enjoyed this snow painting activity! We are going to make the most of this March snow as we wait (im)patiently for spring. Do let us know if you try this activity and how it turned out for you!